Picture it. A theater in Union Square. A packed audience immediately sings along to the iconic theme song of "The Golden Girls." And then Sophia Petrillo, Blanche Devereaux, Dorothy Zbornak, and Rose Nylund parade in. In puppet form. Will the show be a hit or will it be tossed out in the seas of Sicily? That Golden Girls Show! is the puppet parody you never knew you desperately needed. Written and directed by Jonathan Rockefeller, That Golden Girls Show is a faithful parody that honored the hit series yet still maintained originality. The parody follows the quartet through a new, yet familiar, situational comedy where Sophia tries to make cash quick, Blanche suffers a reality check when she's stood up, Rose tried to save a herring circus, and Dorothy is hounded by her ex husband Stan. That Golden Girls Show exemplified brilliant writing. Rockefeller stayed true to the characters and their multi-season arcs. It was as if Rockefeller's script was a treatment for an actual episode. And that's why this show was so strong. Who needs a laugh track when the audience does it for you? In true "Golden Girls" fashion, there were some sentimental moments sprinkled into the big laughs. As much of a great time That Golden Girls Show is, the one character that didn't get lifted from show to stage effortlessly was Rose. This may simply due to the fact that no one can replicate Betty White. Rockefeller's writing of Rose was meager and Arlee Chadwick's take on the airhead did not come close to Betty White level. But that may simply be the reason. No one can truly replicate Betty White and the way she crafted Rose Nylund. 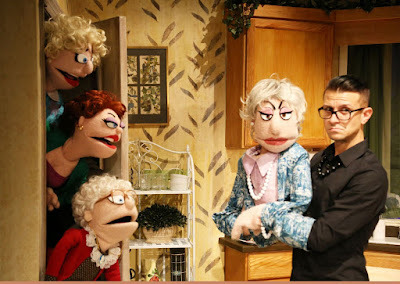 Puppets and “Golden Girls”? In what world should that work? It works in a world when you have extraordinary talent who not only are expert puppeteers but performers with an immense ability to replicate a character. Far and away, there were two standout performances. It was if a recording of Rue McClanahan was being played as Cat Greenfield opened her mouth. Between the spot on physicalization and flawless Blanche dialect, cadence and all, Greenfield's performance was one for the ages. It's something you have to see to believe. Similarly, Michael LaMasa was a fabulous Dorothy. Bea Arthur is iconic for her masculine voice and demeanor so it was fitting to have a male take on the role. But once again, it came down to an extraordinary vocal inflection. Close your eyes and you'd think Bea Arthur was really there. With a waddle in her walk and a shuffle in her step, Emmanuelle Zeesman made Sophia the crass momma we know and love. Though he may not have looked like Stanley, Zach Kononov did a fine job playing the oft-despised ex husband. With the material speaking for itself, Rockefeller did what most playwright-director combos rarely do. Succeed. Rockefeller brought out the comedy of the story while helping his company marry puppet with actor. The focus was solely on the extraordinary puppets created by Joel Gennari. When it came to pacing, Rockefeller found a way to make the ninety minute comedy maintain the beats of a half hour sitcom. And it was aided by smartly allowing the tender moments to resonate. The set by David Goldstein is the closest thing to a replica you can get. The attention to detail was exemplary. Goldstein, who was also in charge of the lighting design, honored the colors of the sitcom with a warmer pallet for the living room and the cooler one in the kitchen. That Golden Girls Show can guarantee that smiles are contagious. This is a perfect show to share with that person who you consider a friend. Just don’t forget to thank them for being a friend. Labels: DR2, Review, That Golden Girls Show!